The citizens of West Bend received a reprieve last night when the West Bend School Board decided to suspend the referendum effort. “Suspend” is the key word. At the meeting, School Board President Joel Ongert made it clear that he wants to put a referendum on the April or possibly next November ballot. It is worth noting that those elections also historically have much lower turnout. That makes it easier for the referendum to pass (if you’d like me to explain this, I will, but I think y’all get it). Ongert also made a comment that he thought that the needs at the high schools warranted $60 million! In the current referendum proposal, they are asking for $31 million for the high schools. Ongert wants to spend so. much. more. Over the next few months as the citizens of the West Bend School District and their School Board consider the prospect of a referendum, we should keep some hard numbers in mind. $215 million. That is how much the taxpayers will be obligated to pay back if the referendum being considered is approved. The district already owes about $130 million due to the passage of previous referenda. If the referendum passes, it will bring that total to about $215 million in owed interest and principal. $2,125. There are about 40,000 adults who live in the West Bend School District. If the $50 million referendum being considered passes, the share for each adult is $2,125. Each adult’s share of the total $215 million debt would be about $5,200. $5.3 million. The taxpayers currently spend about $5.3 million per year on paying down debt. That is $5.3 million that is not spent on educating kids. It is being spent on paying off buildings. That number will increase substantially if the referendum being considered passes. 20. Under the proposal outlined by Baird for the School Board, it will take 20 years to pay off new referendum debt. On the payment schedule presented by Baird at the August 13th school board meeting, the taxpayers will paying only the interest payments for the first nine years. The taxpayers will not pay down a single dollar of the principal until the tenth year. 2.7%. Despite having the authority under Act 10 to control labor expenses, employees of the West Bend School District can still get a family health insurance plan for as little as $49 per month. That is 2.7% of the total cost of the plan. The taxpayers pay the remaining 97.3%. 307. Using the Kindergarten Trend Projection Model, which extrapolates kindergarten enrollment trends to forecast future enrollment, there will be 307 kids in Jackson Elementary in nine years. That compares to the 371 kids who were in the school last year and the 535 kids in the same building at the most recent peak in 2010. That is a 43% decline in student population in the Jackson Elementary building, but also includes the reconfiguration of grades that occurred in 2014. 5,289. Using the same projection model, the entire West Bend School District will have an enrollment of 5,289 kids in the 2027-2028 school year. That compares to the 6,634 kids in the last school year and 6,843 kids in the district in the most recent peak year of 2009. That is a 20% decline in enrollment over the next decade. Different project models give slightly different numbers, but the declining enrollment matches the trend that the school district has seen in recent years. Due to generally lower birth rates, open enrollment, the Wisconsin Parental Choice Program, and demographic shifts, the West Bend School District is seeing the same declining enrollment as many other Wisconsin school districts. 21%. In the most recent open enrollment figures, 21% of the kids who open enrolled out of the West Bend School District left to attend a virtual school. While the West Bend School Board wants to invest in buildings, families are seeking out modern ways to get a quality education. 20. The world of education is not immune from the societal and technological transformations taking place around us. Educational delivery methods now include online and hybrid learning, collaboration with industries, augmented reality, and so much more. The West Bend School Board is asking to spend $85 million on a 20th century education model. Zero. If the voters approve allowing the West Bend School Board to dump tens of millions of dollars into buildings, they can expect zero improvements in educational outcomes. It has been proven time and time again that once the basic safety and space needs for school buildings are met, spending more on buildings does not result in better education. For recent evidence, look at the test scores and graduation rates in the West Bend School District since the other school building referendums were passed. According to DPI data, all of the results are flat or declining. The new Badger and renovated Silverbrook schools look fantastic, but they did not make any kids smarter. That is why the school board has wisely not even attempted to claim that it will improve education in the district. There are a lot of things that the West Bend School Board could do to try to improve education for the children under their care. Dumping money into fancy buildings is not one of them. “We have until next Tuesday to tell the county clerk what our intentions are,” he said. “Are we going to a referendum in November and potential questions and how do we want it to look.” Board member Chris Zwygart spoke first and set the tone for the rest of the meeting. “I’m not sure we’re ready to move forward. The board has a number questions,” said Zwygart. A couple of leaders from the West Bend School Board spoke after the meeting. August 20, 2018 – West Bend, WI – I believe it is important to include the interest cost on the referendum so people know for a fact, what they will be paying. I was on the Citizens Facility Advisory Committee and am very disappointed in the entire process of the decision to go to referendum. The entire process has once again been less than honest. While we are following a 25 year plan, in what world of business do we have a 25 year plan without the plan on how to pay for it. If I were to vote today, I would have to vote no and send the administration back to the drawing board. There are way too many issues to address before moving forward on a building plan. Being on the CFAC committee I had a first hand look at the issues they say they are trying to correct. I could see many of them stemmed from very poor planning and execution to begin with. These are things that have to be addressed so we don’t spend $85 plus million today and end up with the same issue in the future. Here’s an interesting bit of data from a report about Open Enrollment that was presented to the West Bend School Board last night. According to that report, 452 kids left the district through open enrollment compared to 193 who entered the district. That’s a net outflow of 259 kids. Of those who left, 19%, or about 85 kids, left to go to a virtual school. And of all of those who left, the top two reasons given for leaving were convenience or they moved. In other words, the physical location of the school buildings didn’t work for the family. In the 21st century, why does the School Board want to invest tens of millions of dollars in physical buildings instead of investing in modern education delivery models? UPDATE: I may be reading the colors on their pie chart wrong. It looks like it might actually be 21% left for virtual schools. Hopefully we can see the raw data at some point. As you can see, the average salaries in the district are way up since the passage of Act 10. And the average experience of the teaching staff has also increased. It also looks like the average cost of fringe benefits have decreased. I’d like to see more data behind that to see if the decrease is due to an actual decrease in costs or just that fewer employees are taking some of the more expensive benefits. The data does show a dip in the average salary in 2012. That was a year that saw higher teacher retirements in the wake of Act 10. The dip corresponds with a decrease in the average local tenure of the teaching staff. In other words, the departure of old, expensive teachers at the end of their careers were replaced with younger, less expensive teachers. It was not a cut in pay. It was a change in the age demographic of the staff. Since then, the average salary and average local tenure have increased together. The assertion that West Bend’s teachers have experienced a pay cut is demonstrably false. But again… merit pay has nothing to do with cutting pay. It has everything to do with rewarding better teachers who can achieve better results for our kids. As a taxpayer, I’m willing to pay more for better results. I am not willing to pay more for fancy buildings. Let’s reward, attract, and retain great teachers with merit pay instead of sinking more money into real estate. Former West Bend School Board President, Rick Parks, also took issue with Jason Penterman’s letter to the editor in response to my column. To the editor: While I do understand that Jason Penterman’s recent letter to the editor on behalf of the West Bend Education Association was provoked by Owen Robinson’s column on upcoming school referendums, that doesn’t relieve Jason of the need to be accurate in what he publishes. The WBEA has presented the implementation of Act 10 as a pay cut to teachers since it was enacted in 2011. That’s just not true. Act 10 simply required school districts to pass on a percent of the cost for health insurance and retirement plans to employees, just like your employers do where you work. Did that reduce take-home pay? Yes. Does it reduce your takehome pay when your employer passes on your portion of these costs to you? Also yes, but most people would not present this as a pay cut. Jason also misrepresents the merit pay system that was in place for many years in the West Bend School District. When he says “many veteran employees have received no pay increases for six-plus years” he also distorts reality. At the time I left the school board in April 2017, about 94 percent of the teaching staff received pay increases. The 6 percent that did not were on a performance improvement plan. I can’t say how that played out for veteran versus novice teachers, but knowing the range of experience in the district at that time it’s safe to say that almost all veteran teachers were receiving pay increases. During my time on the school board I regularly pointed out to my board colleagues that Act 10 did make a real impact on real people’s pocketbook. I never discounted that. But after seven years it’s time to get over it and move on. It’s also time to stop distorting the facts. Here is my full column that ran yesterday in the Washington County Daily News. After conducting a sham survey that returned the results they paid to get, the West Bend School District’s Board of Education is deciding whether or not to ask the taxpayers for gobs more money via referendum. Given they have been running the liberal playbook for passing a referendum, the school board is expected to punch it over the goal line and put a massive referendum on the November ballot. The school board should reconsider its reckless course and demonstrate the sensible fiscal management that the citizens deserve. At issue is the manufactured facilities “crisis” at Jackson Elementary and the West Bend high schools. While the buildings are both perfectly functional and have decades of use left in them if properly maintained, some folks would like to remodel or replace them. Even though buildings have no impact on whether or not kids get a good education compared to what happens inside those buildings, constructing school buildings is easier than doing the hard work necessary to improve educational outcomes. To that end, the school board created a Citizens Facility Advisory Committee last year that spent months in what proved to be manipulated process designed to tell the school board what it wanted to hear. Then the school board spent thousands of taxpayer dollars to conduct an equally fraudulent community survey that was also designed to tell it what it wanted to hear. On the weight of these two sham activities, the school board is now considering a referendum. The survey results were presented to the school board last week. Of the approximately 40,000 adults in the district, 2,815 surveys were returned, constituting a 7 percent return rate. Of those 2,815 surveys, 93 percent lived in the district and 17 percent were employees of the school district. Even though the survey was disproportionally weighted with district employees and had a small sample, only 53 percent of respondents supported building a new elementary school in Jackson. The school board is interpreting the survey as telling them that the taxpayers would support a $50 million (not including interest) referendum. There are many reasons that the taxpayers should not support a referendum in the West Bend School District, but let us highlight perhaps the biggest three. First, despite the claims of builders and architects who make money from school construction, there is no correlation between fancy school buildings and the quality of education that takes place inside them. Once a minimal standard of safety and function are met, trendy reading nooks and naturally lit atriums do not help one child get a better education. If the school board wants to spend an additional $50 million of the taxpayers’ money, they should at least use the money to provide kids with a better education. Second, enrollment in the West Bend School District is declining and is projected to continue the slide for the foreseeable future. This has almost nothing to do with the school district itself. It is a reflection of demographic trends and the expansion of alternative educational options. Online learning, School Choice, homeschooling, etc., all erode from an already shrinking student population. Why should the taxpayers invest an additional $50 million to build larger buildings for fewer kids? Third, the school board has demonstrated poor stewardship of the taxpayers’ resources by failing to fully utilize the power given to it by Act 10 to manage the largest expense in the budget — personnel. Immediately after Act 10, previous school boards began down the path of implementing things like merit pay and benefits reform, but all of that progress stopped a couple of years ago. Just last week, the Wisconsin Department of Administration released detailed description of the health insurance plans for every school district in Wisconsin. The data shows the least expensive family health insurance plan that the West Bend School District provides costs the taxpayers a whopping $21,864 per year. That compares to an average of $20,062 for all Wisconsin school districts and a national average of $18,764. The other plans offered are even more expensive. The West Bend School District is overpaying for health insurance. Of that premium, a district employee can pay as little as $588 per year, or 2.7 percent, for their share of the premium if they receive a wellness incentive by passing a wellness screening and not smoking. This compares with an average of 11.7 percent for all Wisconsin school districts, 29 percent for state and local government employees across the nation, and 33 percent for private sector employees across the nation. On top of that, the district provides an onsite clinic for employees at no cost to the employees. Such clinics are supposed to lower the cost of health insurance, but the West Bend School District continues to pay well above the average cost for health insurance and asks employees to pay well below the average for their share. A little quick math shows that if the West Bend School District simply paid the national average for a family health insurance plan ($18,764) and required employees to pay the national average share of the cost for state and local government employees (29 percent), it would save the taxpayers of the district $7,954 per family plan. To date, the school board has failed to demonstrate sensible fiscal management on behalf of the citizens of the district. Before the school board asks the taxpayers to sink tens of millions of more dollars into buildings for a district with declining enrollment, they must at least show that they are willing to use the tools available to them to manage the money they already spend. 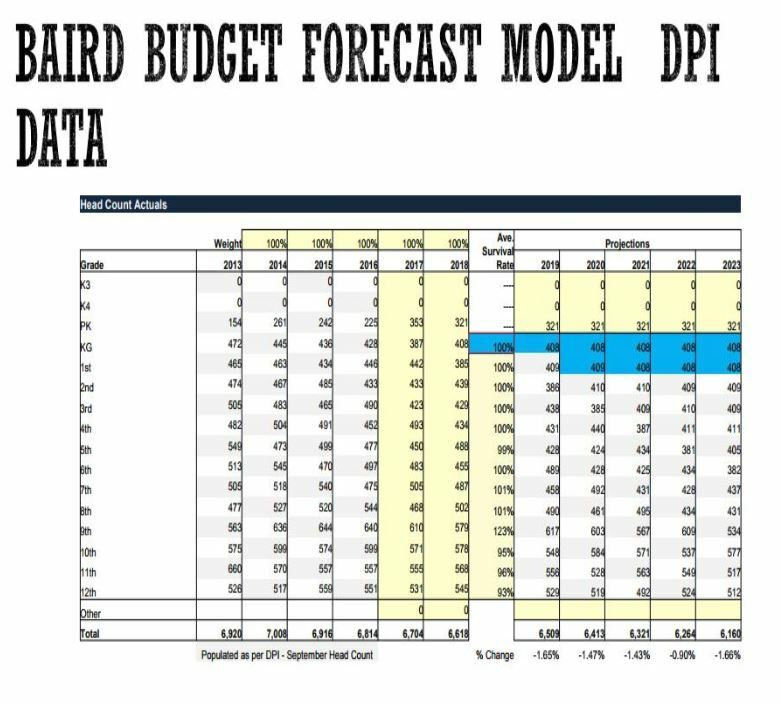 -When look at enrollment projections for facilities as district as a whole there are four methods. Baseline, 2 year projection, 5 year projection and the kindergarten-trend projects. -Look out 10 years on baseline – the district would be down 772 students. -Two year trend – around 870 decline and kindergarten trend projection and that’s almost 1,350 students. That’s anything from a 10% to a 20% decline in the next 10 years. That will also mean a decline in state funding since that is based on a per-pupil model. Why would the taxpayers buy new, bigger buildings? It would be like Sears building a new tower despite projections of a long term decline. The Wisconsin Department of Administration has done the public a massive service by releasing a detailed description of every Wisconsin School District’s health insurance plans. You can find it here. The first thing that jumps out is that the health insurance plans that Wisconsin’s school districts give to their employees are still very generous. That’s not necessarily a bad thing. We want our teachers to have good health insurance, but many private employers offer good health insurance and their costs are lower. The average yearly premium for a family plan in Wisconsin’s school districts is $20,062.44. That compares to an average yearly premium of $18,764 in the U.S. For some rough math… if 50% of the 108,820 Wisconsin public school employees have a family plan and paid the national average, it would save taxpayers over $70 million per year – and district employees would still be receiving good health insurance. The second thing that jumps out is that school districts are not taking advantage of Act 10 to control costs. Act 10 decoupled benefits decisions from union negotiations and left them at the discretion of the governing body. In this case, the local school boards have the power to determine the health insurance plans offered and the amount that employees pay for their share. Across all 422 Wisconsin School Districts, Employees still only pay an average of 11.7% of the cost of their health insurance premiums for a family plan and 11.5% for a single plan. This is far below the average for private or government employees. According to the BLS, private sector employees pay an average of 33% of their health insurance premiums. State and local government employees pay an average of 29%! So here in Wisconsin, public school employees are paying less than half what other state and local employees pay for health insurance despite local school boards having complete power to being their employees into the national mainstream. Clearly, there is still plenty of money to waste in our schools. Of course, since I live in the West Bend School District and they are preparing to ask the tax payers for tens of millions of dollars in a referendum despite declining enrollment, I have to take a look at my own district. In the West Bend School District, the annual premium for a family plan is well above the state average coming in at $21,864. That does not include the fact that the school district provides an on-site clinic that provides services at no cost to the employees and without any co pays. While receiving a more expensive health insurance plan, West Bend School District employees pay far less than other districts. Employees pay 8.2% of the premium for a family plan and 13.3% for a single plan. Furthermore, employees can earn a premium differential. The report doesn’t say how employees qualify for the differential, but a premium differential is generally a discount for things like not smoking, participating in wellness activities, etc. If an employee qualifies for the entire differential, their percentage for a family plan drops to 2.7% of the total premium, or $49 per month. Just to recap, for a family plan, the average American state or local government employee pays 29% of the premium, the average Wisconsin school district employee pays 11.7%, and an employee of the West Bend School District pays 8.2%. If the West Bend School District merely adopted a health insurance plan that was near the national average and asked employees to pay for 29%, it would save taxpayers $8,393 – PER FAMILY POLICY PER YEAR. I ask the taxpayers of West Bend to remember these numbers when the district comes around again claiming poverty and asking for more money. The West Bend School Board, despite their claims of conservative leadership, are failing to manage benefits costs even to national or state norms. The last super made $155k. It looks like the district is paying a premium. June 19, 2018 – West Bend, WI – On May 29 the West Bend School District announced it hired Don Kirkegaard as the new Superintendent. Kirkegaard is scheduled to start in the district July 9. His contract is public record and posted below. Highlights include an annual salary of $175,000, moving expenses up to $15,000 and the “District shall annually contribute 6% of the Superintendent’s salary ($10,500) to a 403 (b) retirement account. No, there’s no free money. The survey says that “in 2019, the District will pay off a portion of the referendum debt from past building projects, and by 2028 the District will make the final payment on all existing referendum debt.” That’s misleading and is intended to give the impression that there is free money to be had.In truth, the district is already carrying the debt from previous referenda to the tune of over $60 million. As with any debt, the district is slowly whittling down the principal, but the interest if front-loaded in the payment structure. What happens next year is that the payments go down a bit as part of the schedule, but the debt is still being paid off. The Survey positions that as “this drop in loan payments gives the community an opportunity to borrow up to $35 million in facility upgrades with no tax increase over the current level.”Let’s put this in terms of personal finance… this is like when a person has a $10k credit card limit. After paying on it for a while, it frees up $1k of credit limit and the minimum payment has dropped. The person says, “I can borrow another $1,000 and my minimum payment will only increase back to what it already was.” That’s exactly how people run their lives without ever getting out of debt.Essentially, what the District is saying in the Survey is, “we have increased your tax burden through previous referenda and we can borrow and spend another $35 million just by keeping your taxes as high as they are now.” They are assuming that the current baseline tax burden, which is already inflated by previous referenda, is the new normal.It doesn’t have to be. The alternative is to pay off the previous referenda as planned and enjoy a tax DECREASE. The numbers cited are not the total debt. The West Bend School Board actually did a great thing a couple of years ago. They passed a policy that said that when talking about proposed debt, they needed to be honest about the total amount. The needed to include the project interest that is part of any debt. They ignored that policy in this Survey. Whether talking about $40 million or $80 million, remember that’s borrowed money with interest for years.For example, the $22.8 million referendum that the voters passed back in 2012 was actually a $31.975 million debt paid back over 15 years. We’re still paying on that. So if the voters pass a $80 million referendum, the total payback would likely be between $100 million and $115 million – depending on the interest rate and payback period. At 4% over 15 years, it’s $106.5 million. The Survey starts with a falsehood. In the introduction, the Survey says, “the Board of Education created a Citizens Facility Advisory Committee (CFAC) last summer. The CFAC, consisting of 28 parents, business leaders, and community members, has studied the educational and facility needs at each location and developed the options explored in the survey.”That’s just not true. Not only was CFAC a sham that was run with a predetermined outcome, but some of the information presented in the Survey was never discussed by CFAC. For example, the Survey discusses the “need” to remodel the cafeteria for $2.2 million. The cafeteria was not covered in the CFAC information packet and I’m told it was not part of any discussion.You will also note that in the CFAC schedule (page 8), the “Committee Presentation of Recommendation to School Board” is scheduled for Late May/ Early June. Well, it’s June 1st and the survey that is supposed to be based on those recommendations is already issued.So what the District is doing is trying to pretend that all of the “needs” cited in the Survey were identified and vetted by a group of concerned community members. It gives the impression that this was a “bottom up” assessment that included community input. Not so. They are using CFAC as cover to give a false impression to the community. It is a dishonest tactic. Frankly, I would be very angry if I had donated my time to CFAC and was used in this way. Remember that enrollment is declining. Enrollment has been declining for a few years (see page 83). Specifically in Jackson Elementary, it served a peak of 536 kids in 2009. This year it has 370 kids and is the smallest elementary school in the district by enrollment. Part of the decline was due to a restructuring of the middle schools, but it has declined every year since then too. The overall district enrollment projections from the February board meeting are below. You will notice that the district is projecting a steady decline in enrollment over the next several years. This has very little to do with the quality of the district. It is a demographic trend of a lower birthrate combined with increasing educational choice. This begs two questions. First, why would we invest in a massive school building expansion for a district that will serve almost 900 fewer kids in 2023 than it did in 2014? Second, as enrollment declines, so does State Aid. That means that more and more of the tax burden will be shifted to local taxpayers unless the district actually reduces spending and taxes to match their enrollment. Why isn’t the district actually reducing spending and taxes if they are serving fewer kids? Credit where credit is due… the Survey does provide an option of “I would not support any referendum.” I encourage everyone to check that box. The West Bend Joint School District #1 School Board voted unanimously to choose Donald A. Kirkegaard as the next superintendent for the school district. Kirkegaard has accepted the position and begins his tenure on July 9, 2018. Kirkegaard is currently serving as secretary of education for the state of South Dakota. He left a superintendent position in 2017 after being appointed as secretary of education by the governor of South Dakota. Kirkegaard’s experience includes nearly 23 years as superintendent of both the Meade School District and Britton-Hecla School District in South Dakota. He was also a principal in the Britton-Hecla School District for six years. While leading the Meade School District, Kirkegaard oversaw the implementation of all-day kindergarten, one-to-one technology for all students grades 4-12, expanded credit offerings, the building of a new elementary school, and new partnerships with businesses to improve the CTE programming. Kirkegaard earned a bachelor’s degree in political science and economics from South Dakota State University, a master’s degree in school administration from Northern State University, and an educational specialist degree in school district administration from the University of South Dakota. He was named South Dakota Superintendent of the Year in 2009. In addition, Kirkegaard was a member of the South Dakota State Board of Education from 2007-2017, serving as president of the board from 2011-2017. He was an executive board member of the North Central Association Commission on Accreditation and School Improvement from 1992-2006, and a member of the South Dakota Governor’s Educational Task Force in 2003. Donald A. Kirkegaard — Prior to being appointed by the governor of South Dakota as secretary of education for the state in 2017, Kirkegaard was superintendent of the Meade School District and Britton-Hecla School District for nearly 23 years. He was also a principal in the Britton-Hecla School District for six years. Kirkegaard earned a bachelor’s degree in political science and economics from South Dakota State University, a master’s degree in school administration from Northern State University, and an educational specialist degree in school district administration from the University of South Dakota. Christopher D. Peterson — Christopher Peterson has 23 years of experience in public education, including nine as superintendent of Howards Grove School District. His experience includes serving as principal in the Manitowoc Public School District, Kimberly Area School District, and the School District of Wausaukee, and teaching in the Little Chute Area School District. Peterson earned a bachelor’s degree in education from the University of Wisconsin-Whitewater, a master’s degree in educational administration from Marian University, superintendent certification from the University of Wisconsin-Milwaukee, and is working on a doctorate at Marian University. Thomas J. Hoh, Ph.D. — Thomas Hoh has 20 years of experience in public education and currently serves as the executive director of secondary education for the Green Bay Area Public School District. Prior to joining the Green Bay Area Public School District, Hoh was a principal in the Ripon Area School District and also worked in the Kaukauna Area School District and Neenah Joint School District. Hoh earned his bachelor’s degree in education and master’s degree in educational leadership and policy analysis from the University of Wisconsin-Madison. He earned a doctorate in education leadership from Marian University. May 7, 2018 – West Bend, WI – The West Bend School Board will hold a special meeting at 5:15 p.m. tonight, to approve spending $35,000 on a community-wide survey regarding Jackson Elementary School and the West Bend High Schools. The Washington County Insider has a lot of background information and financial information. I’ll remind the gentle reader that this is part of a predictable liberal playbook to con the taxpayers into passing a referendum. The school board is about to spend, and has already spent, tens of thousands of dollars hiring sham companies whose sole purpose is to get school referenda passed. In this case, the district doesn’t even have a superintendent. This is all on the school board. May 1, 2018 – West Bend, WI – Six members of the West Bend School Board, (Tiffany Larson was not in attendance), spent nearly two hours discussing a proposed survey to test the waters on a possible $80 million referendum. The referendums would focus on Jackson Elementary and the West Bend High Schools. The survey would be created by Slinger-based School Perceptions. Bill Foster, the president of the company, was in attendance. They have completed steps 1 through 4. During the CFAC process, they even admitted that it was a sham designed to build support for a predetermined conclusion. You can find that video here. Foster’s a hustler. He’s come up with a way to get hired by dozens of school districts who want to get referendums passed. Even my attempts to expose him aid his business by publicizing to other districts how he aids them in their referendum con jobs. What is not defensible is that school boards and superintendents are using public money to mislead their residents and pretending to conduct honey surveys. Yes. That’s the same Foster who attended the West Bend School Board meeting last night. Where are the alleged conservatives on the West Bend School Board? As far as I can tell, they are just walking down the exact same path to more spending and debt as any liberal school board would. They are using the same techniques. They are using the same propaganda. They are using the same companies. They are spending our tax dollars to advance this propaganda. And they are about to ask the taxpayers for tens of millions of dollars to dump into buildings in a district with flat-to-declining enrollment. As far as I can tell, the Milwaukee School Board might as well be running the schools in West Bend. We would be getting the same result. But at least the liberals on the Milwaukee School Board are honest about their liberal intentions. Now that I’m back in town and have had a few minutes to look at the election results, I have a few thoughts on the local races. Here are the Washington County Results. First, turnout in Washington County was impressive for an April election. Some races on the ballot pulled in 42% turnout and the county average was about almost 37%. Not bad. Second, congratulations to Chris Zwygart and Kurt Rebholz who won convincing victories for seats on the West Bend School Board with 38.45% turnout. And thank you to Monte Schmiege for his service to the community. As I said in my column, I think that the four candidates are pretty conservative and would find agreement on probably 90%+ of issues. I have a high degree of confidence that they will be solid stewards of the school district. It is curious how different the results were with the same four candidates in the primary election. Clearly, a lot of work happened between the primary and the general election. Third, I am flabbergasted that the City of West Bend voters voted FOR a tax increase to fund spending increases for transportation. Granted, it was for the cheapest option and it only won by 110 votes, but that’s shocking in this community. They also voted to encourage the county to share sales tax revenues with local communities. That makes more sense. I’m going to admit that I didn’t really have any time to figure out the the aldermanic or county supervisor races. I did find it curious that the two incumbents for the Kewaskum School Board won reelection. That district just passed a big school referendum, so it appears that the voters up there are still pretty satisfied with that. Overall, the Blue Wave we saw at the state level clearly had an impact locally too. Given the results, I would expect every local unit of government that wants more money to get a referendum on the November ballot to capitalize on the wave. Good for the kids in West Bend. Despite being encouraged by the district administration, assured that there would not be any consequences if they walk out, and the administration pushing the protest all the way down to the 5th grade, the vast majority of the kids stayed put. Kudos to a student body that has more sense than some of the folks teaching them. “Administrators and teachers at West Bend Joint School District #1, West Bend East High School, West Bend West High School, and Badger Middle School are aware of the potential peaceful school walkout on March 14 at 10:00 a.m. by students to show their concerns about school safety. “The West Bend School District will not penalize students who choose to assemble peacefully for 17 minutes on March 14. After talking with students and staff, the school principals have developed plans to maintain the safety of the participating and non-participating students and to minimize interference with educational programming. “Those students who wish to participate in the walkout will be monitored and supervised by school staff to ensure that any walkout is safe and orderly. The West Bend Police Department will also help to ensure the safety of students to assemble in predesignated areas. School is for school. The kids are there to get an education. Of the 168 hours in a week, the kids spend less than 40 in the classroom. They can protest on their own time. The real problem is that now the school district has inserted itself into being an arbiter of political issues. Would they do this for a Black Lives Matter protest? Anti-abortion protest? Pro-2nd Amendment protest? Pro-illegal immigration protest? $15 minimum wage protest? Which ones does the school staff supervise and which ones do they prohibit? What they should have done is reiterate to the kids the importance of education and enforced their normal policies for tardiness or unexcused absences. If the kids want to protest, then so be it. Who ever said that protesting is free of consequences? The meeting had three parts to it: the first was an update to the board by Bray on the work they have done to date, the second portion was dedicated to looking at the districts debt picture which was presented by Robert W. Baird and the third part was an overview of the methodology for the community survey which was presented by School Perceptions. Matt Wolfert from Bray Architects reviewed the drawings with the board including the renovation option for Jackson. The board asked a lot of questions but seemed quite pleased with the progress that has been made to date. Brian Brewer from R.W. Baird reviewed the debt picture of the district. The district does have some existing debt but has structured that debt wisely. In addition, the district has been putting money into the Jackson Trust. The long and short of things is that the district could do as much as an approximately $40 million referendum and not raise property taxes because of the structure of the existing debt and the Jackson Trust. Finally, Bill Foster of School Perceptions presented on how his company would go about performing a community survey. He also advised the board to listen to the results of what the survey told them. Failing to do so often leads to an erosion of trust in the board from the community. This was a really short overview so I would encourage you, (especially if you’ve got a spare 2 or 3 hours) to watch the video. provided a fairly good overview but more importantly gives many references/sources for further investigation. As always, if you have any questions, please let me know and I’ll do my best to get you an answer. Based on the email, it looks like they are going to try to pull the “let’s spend $40 million (plus millions more in interest), but we won’t increase taxes.” Of course, that commits more of the operating budget to debt service, thus reducing funds for teachers, supplies, etc. It also completely misses the opportunity to decrease taxes as those older debts are paid off. Such a move of spinning off debt for decades in order to keep the yearly expenses lower also increases the likelihood of tax increases in the future. It tightens the part of the budget that can be used for actual operations, and remember that enrollment in the district is expected to decline. As enrollment declines, so will funding. But the debt service must be paid. The end result is that there will be less and less money for the actual operating funds that can be used for paying staff and supporting the daily operations of the district. Putting another $40 million on the district credit card in an era of declining enrollment is reckless fiscal management of the district. It will be interesting to hear from the school board members and school board candidates as this discussion evolves. The district is expected to have about 6,509 students during the 2018-19 academic year and by 2023-2024 that number is expected to decline near 6,160. “This all could change with the economy,” Van Spankeren said. The trend is normal and being seen at most other districts he said. This academic year there are 6,729 students in the district, according to how districts are supposed to count them. The actual head count is 6,909, but students who don’t attend a full day of school, like 4K students, count as less than one. Of course, projections could always change. I remember a few short years ago when the district was asking for a huge pile of money in a referendum that they were projecting increasing enrollment. But this projection is worth keeping in mind as the district prepares to ask for millions of dollars in a referendum to build a new Jackson Elementary that will be much, much larger than the one that’s already there.